Role > Each quarter, I was responsible for flowing in and organizing all articles and images. Often I was called upon to develop diagrams and graphs displaying sales information for each product. Periodically, I developed spot illustrations for the articles. Objective > The objective was to create an informative internal newsletter that was also cross-marketed to prospective new clients. It outlined the objectives and direction of TradeWeb upper management and product managers. 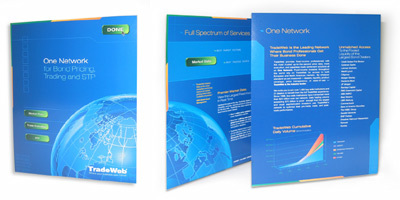 Results > The result was a periodic newsletter that informed and sold the product base to prospective consumers. This newsletter was successful at outlining the upward progress of TradeWeb, especially against their competitors in a highly volatile market.